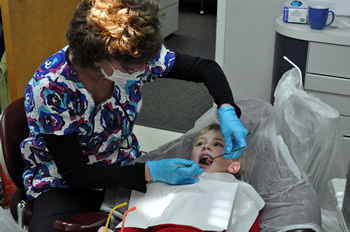 Dr. Vaughan believes that a child’s first dental appointment is the most important visit they will ever have. Because of this belief our experienced staff will make the appointment fun and non-threatening. It sets the tone for all future visits. If a parent choses they can bring their child to one of their appointments for a “ride in the chair”. The first visit is usually between the age of 2 and 3 depending on your child’s needs and personality. For more information this link may be helpful in answering frequently asked questions. If you need additional information please call us and we will gladly help.